Sadfyl is a more correct form of the name commonly anglicized to Sidwell. She was born of noble parents, the daughter of Lord Perphir from Penychen (in South Wales). She was part of a large family of nine brothers – amongst them Paul, Pautel, Nautel and Bana – as well as three sisters – herself, Aude and Weluela. Their mother died when several of them were still teenagers. Their father married again and they settled in Halstock in eastern Dumnonia (Dorset). However, after the death of the eldest sister, Aude - due to the plotting of the step-mother - the family seems to have moved to Caer Uisc (Exeter). Not content with causing the downfall of one sister, the step-mother turned her attention to young Sadfyl. She bribed a group of mowers on the estate to murder the poor girl. So one of their number sliced off Sadfyl's head with his scythe. A miraculous spring immediately welled up from the ground and Sadfyl's head was thrown in. For three nights, a shaft of light shone down over the murder-site. On the fourth night, Sadfyl's body was resurrected. It picked up its head and walked a short distance to the spot where she desired to be buried. St. Sidwell's, now in eastern Exeter, was built over her grave and many miracles were wrought at her shrine. 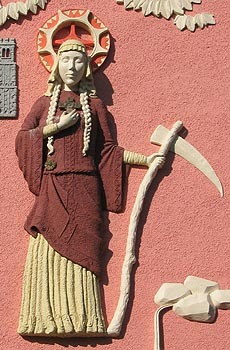 Sidwell has another church dedicated to her at Laneast in Cerniw (Cornwall). However, the association may only date from 1437. Sidwell, the common form of Sadfyl's name has, no doubt, been influenced by the name of her spring or holy well. Her feast day is 1st August.